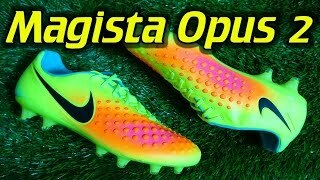 Nikes Magista boots are an absolute must for any creative playmakers who control the game with the ball at their feet. Players like Christian Eriksen, Andrés Iniesta, Sergio Busquets who are not blessed with power and pace, but have the football intelligence to find gaps in the opposing defense. 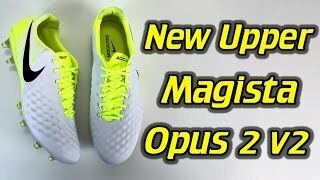 The upper on the Magista Opus II is made from a synthetic water repellent material called Kanga-lite. This material is made to replicate the properties of premier Kangaroo leather, but at a cheaper production cost. 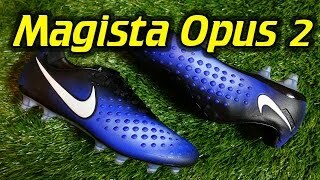 Nike’s research and development team engineer the Opus upper based on the areas of the foot most used by footballers and the areas that are most touch sensitive. This enabled them to create the Opus ii as an extension of the leg rather than a shoe on your foot. The main performance features of the upper are the inner padding and integrated dotted texture. These features help the player get a better feel for the ball. The added grip created by the dotted texture creates vital friction between the boot and the ball, giving you more control over the ball when dribbling at sprint pace, whilst also providing added control for passing and shooting. This grip is improved further by Nike’s All Conditions Control technology, which gives you added control in any weather. In the past most football boots were created with a flat outsole, however, Nike’s research and development team had other plans. They choose to create an outsole plate that glides anatomically with the player’s foot, which fit naturally with fewer gaps, whilst improving the snug fit. Speed and agility is a massive part of the modern game. Therefore any creative player who is tasked with dictating the play and making chances needs to be able to accelerate off the mark and speedily change direction. 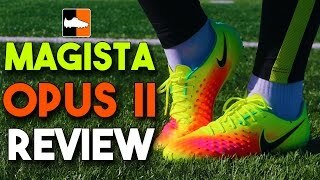 With this is mind Nike created a new stud layout which highlights key pressure points and how the power flows through the foot. Studs are situated in the part of the sole which need the most traction and grip, which angled studs used to rake the turf when turning and needing quick acceleration. This stud pattern also helps slow a player down for instant stopping or quick movements. The Split toe function improves the flexibility of the foot, which gives the player more traction. This is designed to support 360 degree turns and works efficiently with the front studs. 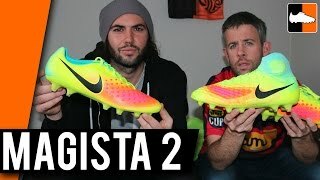 This entry was posted in Nike Magista Football Boots. Bookmark the permalink.